In the State of the Union address last night, President Obama called for a plan to create a growing economy, calling it our North Star. In pursuit of the goal of economic growth, the president outlined three questions that we should ask ourselves every day. Here are some economically sound answers. The first step is to cut the corporate tax rate. The U.S. currently has the highest rate in the developed world. The president has proposed a cut down to 28%, but would "pay for it" by eliminating deductions. This would get us down to a more competitive rate, but does not go far enough to make up for the eliminated deductions, and certainly does not solve the entire problem. The next step should be a shift to a territorial system. But we don’t just want jobs, we want jobs that pay well. The types of jobs that the U.S. needs to attract are those that come when companies headquarter in our country. To gain these types of jobs, the tax code must become a less burdensome, simpler code with a lower rate. After all, it’s not the corporation that we harm with high tax rates – its workers, consumers and shareholders. So, we need to make education more affordable. The question is how. The shift away from traditional loan and direct subsidy programs (such as Pell Grants) toward various tax credits and deductions tends to benefit high-income taxpayers much more than low income families. Unfortunately, direct subsidies will not solve the problem either. 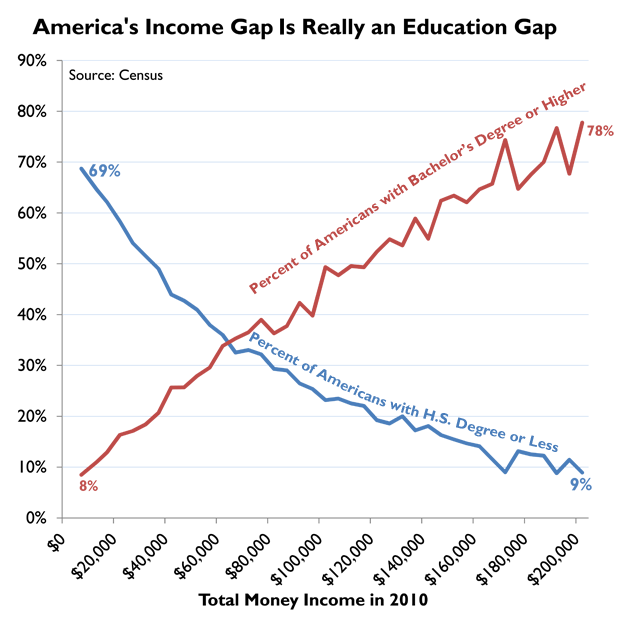 In his speech, the president reference his new college scorecard which lays out where students can get “the most bang for your educational buck.” But preparing the workforce for work goes further than sheer cost. When asked if young people were ready for the workforce, less than 50% of young people and companies answered yes. Additional tax credits will not fix the problem. Instead, education in America needs structural reform that brings down the cost and prepares workers more effectively for the work force. A greater emphasis on on-the-job-training, trade schools, and alternative forms of bachelors and masters programs. This shift will increase supply in the education market, decrease demand for traditional four year schools, and get students the education and training they need to capture available opportunities. Instead, the best means to increasing a worker’s wage is to increase productivity. When productivity increases, costs decrease or output increases, and workers experience the benefits. How do we increase productivity then? The best way is to increase capital investment. Lower investment and business taxes increase capital investment, thus wages. A high tax rate on investment damages capital formation and investment. It’s simple: when you tax something, you get less of it. On the other hand, a low rate on capital allows it to flow freely to where it will be most effective. This, in turn, improves productivity and wages over time. Secondly, the reduction of the corporate income tax, the cost of which (as I mentioned earlier) is borne by workers, would go a long way in making sure that hard work leads to a decent living, by increasing workers’ wages, encouraging economic growth, and leading to more jobs. The sequester would reduce spending and the deficit, but as the president said last night, "deficit reduction is not an economic plan". But neither is taxing the rich. Nor is maintaining the highest corporate rate in the developed world. If the president wants “a growing economy that creates good, middle-class jobs” then he needs a tax plan that supports his goal. A cut to taxes on investment (instead of his recent increases) and corporate tax reform would be a good place to start.